The relationship between boys (not men) and the 1980s action movie craze is something which is difficult to explain. It’s really a meeting of circumstances more than anything else. As you know, David, back when the PG-13 rating was either nonexistent or new (coming to pass because of Indiana Jones and the Temple of Doom), the R-rating had some leeway from movie theaters. It had just the sort of forbidden allure that was intoxicating to boys aged twelve to fourteen. What did you want to do when you wanted to show how much more grown up you were than Star Wars (even though you weren’t)? Well, you went to see one of the many R-rated movies out there in theaters or on VHS. The movie industry was completely complicit in this. Aliens, Robocop, Terminator, Predator, and Rambo (part II and III) had massive fanbases amongst those who were technically too young to see them. I won’t lie to you, there were also other allures of R-rated movies that newly puberty-blessed/stricken boys would hope to be in these sorts of films, especially the really bad ones. The internet has wiped out the allure of these latter ones completely. What am I blathering on about? Well, what I’m trying to get at is that 1980s action movies were marketed as often as not at kids as well as adults. I could have said that upfront but I wanted to solliquoy about my childhood. 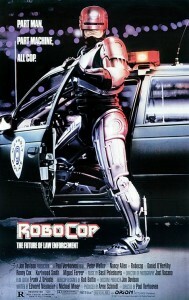 Listening to you guys talk about Robocop, I pity the next generation to some extent because they lack the kind of wonderful transgression R-rated movies made for them gave the opportunity for. It’s a rite of passage which has ceased to exist (and I’m totally stealing this post’s opening for my Far Cry 3: Blood Dragon review). I mean, why else was Terminator 2 about how cool it would be for a 14 year old to have his own Terminator? Anyway, back to Robocop, I saw the remake and it made me realize that no boy would see this film and think they were getting away with something. That makes me sad. I mean, there’s MORE to Robocop than guns, cyborg fascism and unapologetic unlimited punishment, and exploding limbs/bodies. There’s satire about corporate culture and the deadening of America and other smart stuff–but I’ll be honest, I saw it for the kickass Robot Man killing criminals like the Punisher…only BETTER.